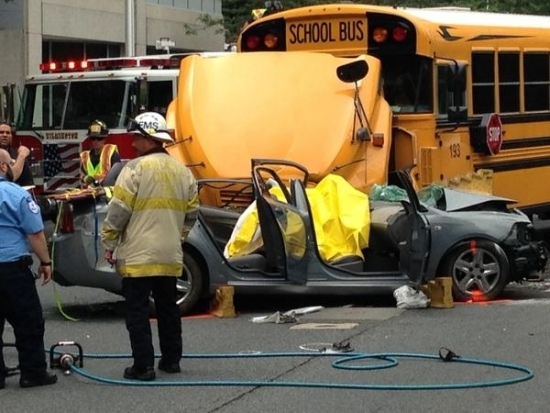 A man being chased by police was killed after his car collided with a school bus this afternoon in Wilmington, DE. It happened around 1:30 p.m. Tuesday on the 800 block of Delaware Avenue. Wilmington police spotted the man driving erratically through the city streets and attempted to pull him over but he sped off. At the point where 12th Street turns into Delaware Ave. the man lost control, hopped the median, and slammed into the bus. There were no children inside at the time. The bus driver suffered a minor knee injury. The suspect was trapped inside and pronounced dead a short time later. The identity of the driver is not being released pending further investigation. The Stafford Township Police Department in Ocean County has released video of a small plane that landed on Rt. 72 near Rt. 9 over the weekend. The single engine plane was carrying students from the Skydive East Coast skydiving school at the time when it lost power around 10:00 a.m. Sunday. The pilot was forced to make an emergency landing on the median of Rt. 72 near the Home Depot. One instructor was treated for a cut on their arm but otherwise there were no injuries. Rt. 72 is the only road on and off of Long Beach Island, NJ. Traffic was stopped in the left lanes in both directions while an investigation was conducted. The FAA will conduct any further investigation. The King of Prussia man convicted of killing a 61-year-old grandmother and her 10-month-old granddaughter and sentenced to death will represent himself in the appeals process. Ragu Yandamuri previously represented himself at trial. Montgomery County judge Stephen O’Neill granted Yandamuri's request to act as his own lawyer but cautioned him against it as legal technicalities such as format or deadline of briefs can unravel his case. Yandamuri was found guilty of the two murders at the Marquis Apartments in King of Prussia in October 2012. It was described as a kidnap for ransom gone bad.